Click the button below to add the Apple MacBook Air 13.3-Inch Laptop (1.6 Ghz Core i5, 4 GB RAM, 256GB SSD), Early 2015, Fair Grade to your wish list. The MacBook Air features fifth-generation Intel Core processors with stunning graphics, ultrafast flash storage, great built-in apps, and all-day battery life. * It's thin, light, and durable enough to take everywhere you go — and powerful enough to do everything once you get there. The MacBook Air with 13.3-inch screen gives you up to 12 hours of battery life. 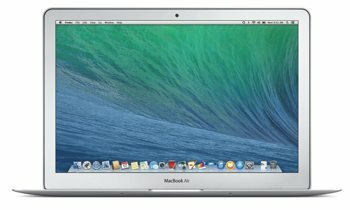 This 13.3-inch model of the MacBook Air (MJVG2LL/A) sports up to 12 hours of battery life, a 1.6 GHz Intel Core i5 dual-core processor (with a Turbo Boost of up to 2.7 GHz), 256 GB of flash memory storage, and 4 GB of RAM (see full specifications below). It also includes both a high-speed Thunderbolt port and two USB 3 ports, enabling you to easily connect to external displays and a wide variety of high performance peripherals. The MacBook Air is powered by OS X, the world's most advanced operating system and built to bring out the best in your Mac. Power through your whole work day with the 13-inch MacBook Air, which delivers up to 12 hours of battery life — more time power for word processing, presentations, email, and more. The increase is due to a larger battery (thanks to the compact all-flash storage in the MacBook Air) and the new power-efficient Intel Core processor architecture. Put the MacBook Air to sleep for more than 3 hours, and it enters standby mode to conserve battery life for up to 30 days. And with the Intel HD Graphics 6000 processor, you get up to 40 percent faster graphics — performance you'll especially notice with games and other graphics-intensive tasks. Delivering an amazing 20 gigabits per second of transfer speeds in both directions, the ultrafast and ultraflexible Thunderbolt port allows you to move data up to 20 times faster than with USB 2.0 and more than 12 times faster than with FireWire 800. You can also daisy-chain up to six Thunderbolt-compatible peripherals without using a hub. Thunderbolt also supports DisplayPort for high resolution displays and works with existing adapters for HDMI, DVI, and VGA displays. Extended one and two year warranties are available. For more details, view the Warranty section in Shipping an Returns. Did you know? Most homeowner or household insurance policies offer the option to add computers as a scheduled personal property (SPP). This provides great coverage (covering loss, damage or theft) for as little as $1 to $2 per $100 per year with no or low deductible. Check with your insurance agent for specifics.